I used this cake recipe and made cupcakes. 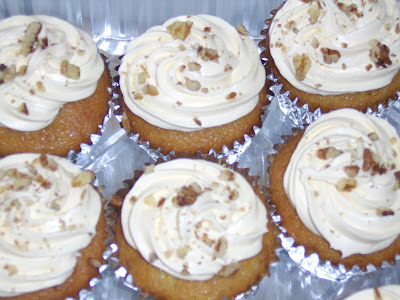 I frosted them with butter cream frosting and sprinkled pecan pieces on top. For sour milk, I used the old fashioned method of adding 1 tablespoon of white vinegar to 3/4 cup milk. You could also subsititute with buttermilk. I baked them for about 25 - 28 minutes. In a large bowl, mix together butter or margarine, sugar, eggs and vanilla. Set aside. In another bowl, sift together flour, salt, soda, and baking powder. Add these dry ingredients to the creamed mixture. Add sour milk and bananas to the batter. Beat together well. Line two 9 inch round cake pans, or one 9 x 13 inch pan with wax paper; the pans can be greased and floured instead, if desired. Bake at 350 degrees F (175 degrees C) for 17 to 20 minutes for the layered cakes, or for 25 to 40 minutes for the sheet cake.